Dandelion and prawn fritters are a really simple starter for entertaining and certainly a conversation opener. 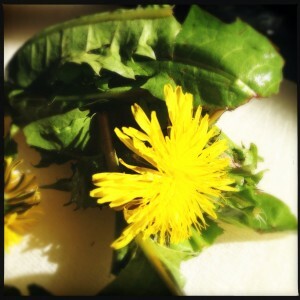 Also did you know that dandelion leaves have more beta-carotene than carrots and more iron and calcium than spinach. They are also best harvested in early spring when they are young and tender. Add a small knob of butter to a small pan and add the garlic. Toss in the prawns and dandelion leaves quickly saute until wilted. Take off the heat and put to one side. In another pan melt the rest of the butter. 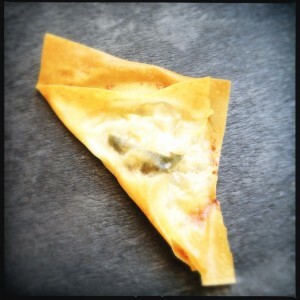 Lay out the filo sheets and cut into eight squares. 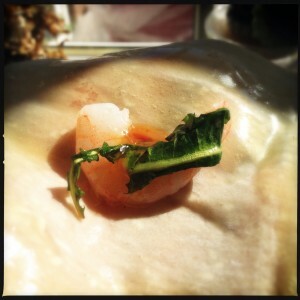 Pop a prawn and dandelion leaf into each square and a small dollop of sweet and sour sauce. Brush the melted butter around the edges of the squares and fold the squares over to make a parcel. Place in a pre-heated oven set to 200 degrees C for about 10 minutes or until the filo has browned.